In our work, we strive to understand the impact leaders and their teams have in their organizations, and we facilitate a focused and direct action-planning effort on how they might elevate their impact as they solve problems or execute work. As leaders and managers, the behaviors they promote and the ways they treat each other as they approach their work are also observable as they do their work. And from our experience, an organization desiring to leverage culture as a strategic asset is best served when its leaders can link culture change efforts to the ongoing changes associated with strategy execution. This formal integration of strategy and culture provides a unique opportunity for proactive, measurable application of efforts that shift behaviors to be more constructive in nature, while leaders, teams and individuals are doing their real, day-to-day work. As an extensive user of valid and reliable measurement tools, we find the quantitative analysis of operational behaviors to be quite practical in helping organizations and their leaders cultivate performance-sustaining cultures. Our vendor of choice for measurement diagnostics is Human Synergistics, a leading provider of integrated organizational assessments for individuals, managers, leaders, teams and work groups, and organizational culture. We incorporate nearly all the HS tools in our consultancy work and some of them are mentioned in this article. 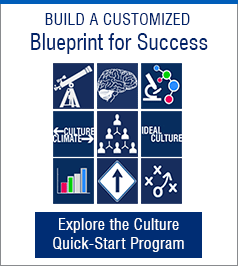 We have witnessed firsthand how organizations start off wanting to leverage culture to improve their performance. However, even after administering a cultural assessment and forming culture teams and constructively oriented initiatives, the companies that do not link culture change directly to real work activities struggle to shift behaviors. Almost always, the result is frustration, time waste, and investment loss. One way we facilitate this integration of strategy and culture is through an annual administration of the Leadership/Impact® (L/I) and Management/Impact® (M/I) surveys.1, 2 What better scenario exists to apply a valid and reliable measurement tool than crafting the work a client will be executing in pursuit of strategic goals? When deciding which business challenge to follow, a new line manager studied the company’s four strategic goals and concluded that safety was the biggest gap for the department—they received three OSHA recordables the previous year. A recordable injury or illness under OSHA is one that requires medical treatment beyond first aid, as well as one that causes death, days away from work, restricted work or transfer to another job, or loss of consciousness. In analyzing the group dynamic, the manager determined that supervisors were not spending enough time in the field and field teams were frustrated by continuous requests with insufficient explanation. This distracted them from focusing fully on safe work. Understandably, the manager chose safety as the business challenge for the supervisors’ M/I action plans. In assessing and preparing to work with the supervisors, the manager concluded that they were allotting too much time for both administrative work and out-of-region committees, thereby siphoning time better spent in the field. A review of the supervisors’ M/I results and conversations with the field crews revealed that the supervisors were driving a fear-based response (Circumplex styles of Avoidance and Dependent), and that crew members lacked understanding of the goals and specific KPIs (Managing Goals). Additionally, the manager observed that crew-to-supervisor field relations were strained by poor communication (Managing Communications), overuse of power, and a lack of good working relationships across the teams (Managing Inter-Unit Relations). The manager immediately reset safety as a business priority. And with the aid of the Circumplex, the manager helped the supervisors visualize and comprehend the need to demonstrate and promote more Humanistic-Encouraging behaviors in their daily interactions. Specifically, the supervisors needed to repair and then deepen good working relationships with crew members, which in turn would support more effective coaching. This work group also agreed that a secondary focus needed to be on Achievement to address the lack of clarity on goals and priorities and the lack of understanding about why priorities were shifting. In summary, the renewed focus on safety would be supported by improving the M/I management approaches of Managing Goals, Learning and Communications. The manager worked with the supervisors to build skills in delivering messages and fielding questions to help front-line workers better understand and support change and shifting priorities. To support the supervisors’ development, the manager looked across regional operating borders to identify highly effective supervisors in other service areas and arranged for peer-to-peer coaching. Through the peer coaching relationships, the supervisors worked together and adopted a standardized pre-work checklist that helped crews focus on critical safety factors. Peer coaches helped them improve time management, allowing for more time in the field with crews, and worked with the supervisors to increase skills in delivery of messages that were supported by more context. The field manager worked with the regional director to better translate the safety goals for the front line. In addition to improving the team of supervisors, the field manager knew that each supervisor was different and could benefit from tailored coaching. For example, the field manager worked specifically with one supervisor to improve his approach to self-development and managing emotions. This supervisor was provided with training in time management, self-management and, to overcome his historically blunt style of interacting, communication. Today, the department is proud of their zero-incident record (as of Q3 2018). The field manager’s improved relationship with the supervisors and the supervisors’ deeper connection with the front-line workers have worked well to quell fears that previously existed. The front-line workers are more focused on safe operations because they better understand their roles and the “why” behind changes brought to them. The department has achieved significant improvement in all Constructive norms, especially Self-Actualizing and Humanistic-Encouraging. The most challenged supervisor, who took advantage of additional development beyond what was completed by and with his peers, has transformed into a top performer, leveraging strong messaging skills, leading the use of pre-work safety checklists, and continuing to deepen his trusting relationships with the crews in supporting change. By promoting the value of growth, learning, and managing work execution through clear goals and expectations, the supervisor team was able to shift away from their administrative focus and to instead emphasize key safety items, engage teams in discussing them, and provide more time for dialog about changes coming down from above and what they meant for the teams. Examples of the improvements in M/I results are illustrated by the impact profiles below. The supervisors’ Circumplexes above show the important shifts in their impact, away from Defensive and toward Constructive, that resulted from a well-executed improvement plan supported by coaching. Note: The Circumplex is Human Synergistics’ circular graph that provides a visual framework to quantify, describe, and understand organizational culture, personal styles, group processes, the impact of leaders, and how they’re integrated—or out of alignment—with the organization’s values and preferred culture. It breaks down the factors underlying effectiveness into 12 specific styles that are arranged in a circular manner based on their similarity and grouped into three general clusters: Constructive, Passive/Defensive, and Aggressive/Defensive. For related information on these styles, visit the interactive Circumplex and click through the graphics. 1 Cooke, R. A. (1996). Leadership/Impact® (L/I). Plymouth, MI: Human Synergistics International. 2 Szumal, J. L. & Cooke, R. A. (2008). Management/Impact® (M/I). Plymouth, MI: Human Synergistics International. 3 The terminology is from Robert A. Cooke, Ph.D. and J. Clayton Lafferty, Ph.D., Organizational Culture Inventory® and Organizational Effectiveness Inventory®, Human Synergistics International, Plymouth, MI. Copyright © 1987-2007. All Rights Reserved. Used by permission. Photo credit: rawpixel on Unsplash. Kevin Smith has over 20 years’ experience in strategy development, branding, and organizational effectiveness. This knowledge and skill set was built in agency, corporate, entrepreneurial, and consultative environments, working across a variety of both business-to-business and business-to-consumer sectors. In industries such as technology, telecommunication, energy, health and wellness, engineering, and state government, Mr. Smith has worked with such organizations as IBM, Sun Microsystems, Ogilvy Mather, Qwest Communications, Teletech, Southern California Edison, Sherwin Alumina, Denver Public Schools, Idaho Transportation Department, and American Sentinel University. Mr. Smith is currently co-owner and Vice President of Ephektiv, a multi-discipline business performance consultancy specialized in driving performance through employee engagement. The firm has developed and deploys proven proprietary methodologies for mature and start-up organizations alike, needing a scalable, manageable approach to executing strategy, developing leaders, cultivating a culture of performance, and managing a strong brand. Kevin attended undergraduate college at the University of Arizona where he received a bachelor of fine arts (BFA) in Film and Media Production and Marketing. Mr. Smith also has a Master of Science in Organizational Development and Management (MSM) from Regis University in Denver, Colorado.